I decided to do the update a few hours early because the electricity is being worked on and I don’t know when I will be without power. The cat above is my daughters cat. 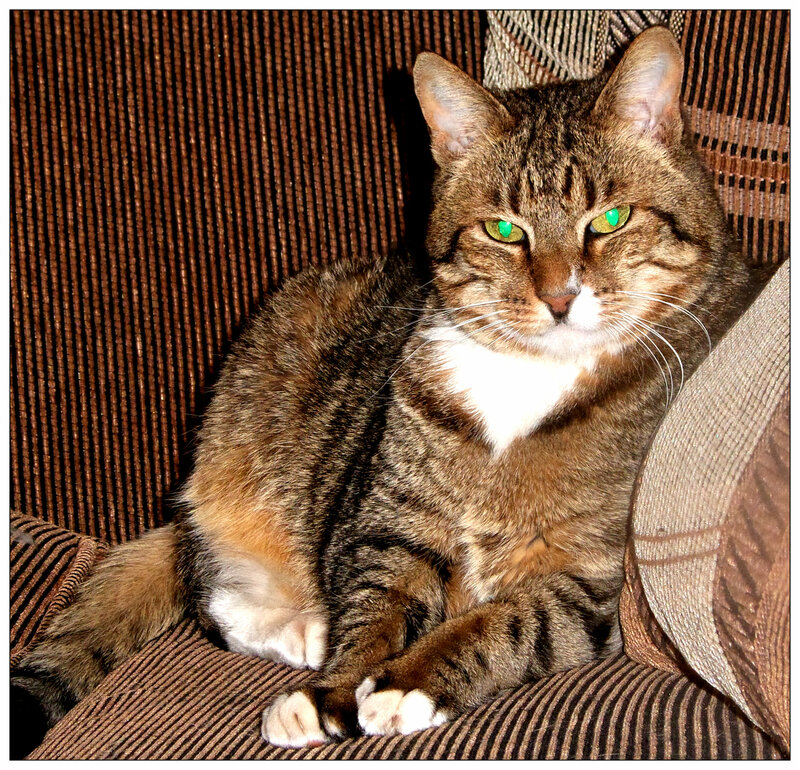 I think the flash on my camera was a little bright on her eyes, hence the green pupils. She was also a rescue kitty. My daughter has had her since she was a very little girl. I find now that my daughter is older and is out quite a lot, this old girl comes to sleep with me often. She does not like being disturbed though. She is one of those cats that you try not to bother whilst she is sleeping. She is 14 years old now and acts it too in many ways. I like having her around though, she is a very sweet old girl. 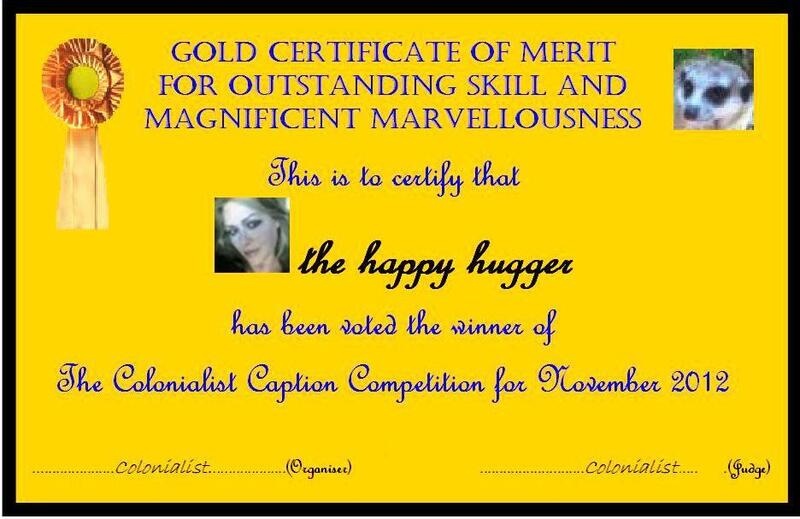 Thank you to those who took part last week. Here are their links, please pop over to these posts they are lovely. Just simply do a post of your pets, or pets of your friends or family. You can also post pictures and stories of animals that come and eat food you leave out for them. Eg, you may have a bird feeder in your garden. Pictures taken in the wild are also very welcome. 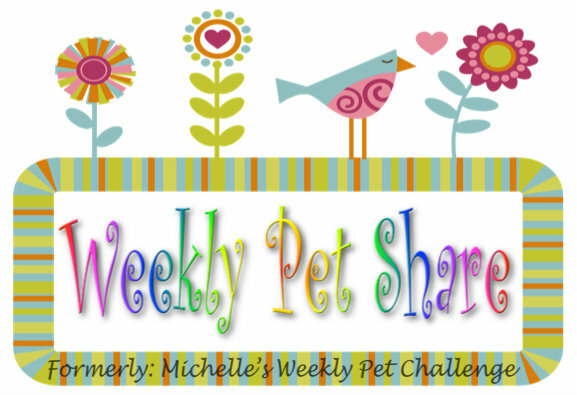 Link back here and head your post as “Michelle’s Weekly Pet Challenge.” Display the logo on your post or on your sidebar. 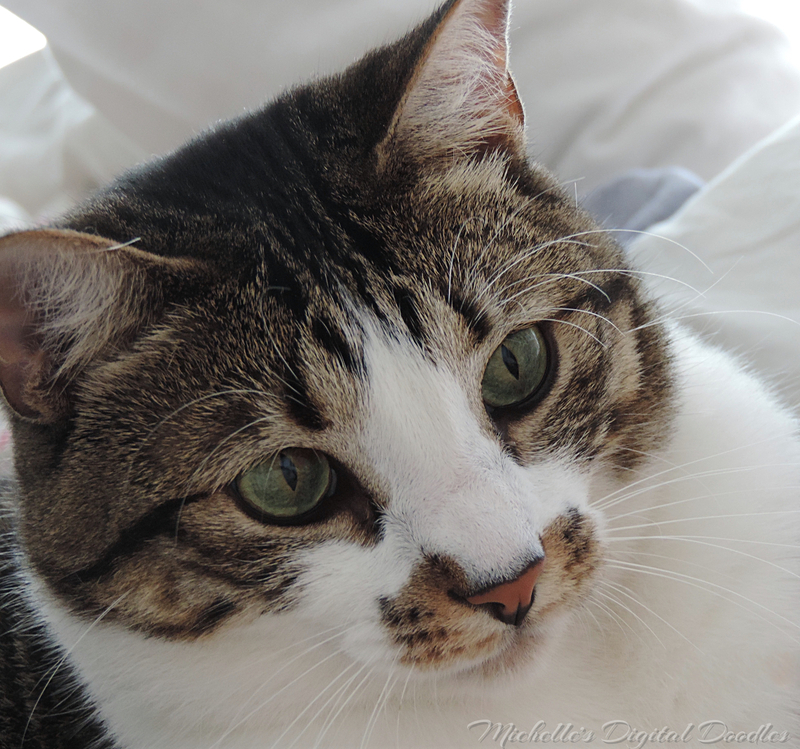 Sweet looking cat – a feline impresario. lovely pic! it makes me think of my own cat in peru! We have a 19 year old cat, the cat that will outlive us! wow! 19 is really old for a cat. Must be living a good life with you, John. He’s my son’s cat and he babies the cat to death! That’s a wonderful cat! I, too, have inherited my daughter’s cat, which is also 14 years old, what a coincidence. If my daughter asked for her cat back at this point, I would most likely say “No” in a heartbeat. Here’s a new one for this week from me. She’s so pretty! What’s her name? She does blend well. Thanks for sharing your lovely picture, Steve. I enjoy doing it, Col 🙂 Thank you for joining in. Thanks so much for sharing your sitting pictures, Pommepal, they are lovely. Not late at all 🙂 The challenge is weekly so you can post right through the week. I love your lounging pictures, they are so sweet! 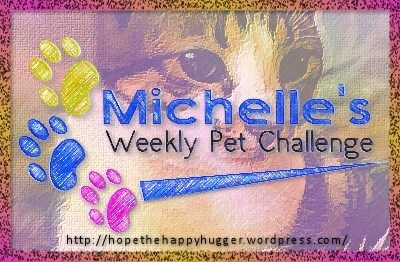 Hi Michelle, my favorite pet plus something just for fun – a surprise guest character in my heron blog. Thanks for sharing, Cee, she is so sweet!